Apparently, the first bout of John Wayne Parr’s retirement tour leg is beginning and as has been rumored the 3rd (And expectedly the last) of the trilogy of bouts between John Wayne Parr and Mike Zambidis of Greece is set to happen. Powerplay Promotions brings the 3rd match on May 27th, 2011 at the State Netball & Hockey Centre. Parr and Zambidis have met two times prior. One for the K-1 MAX Oceania qualifier in which Zambidis beat Parr by points in November 2002, the second time Parr won by a wide points win in May 2009, and the third fight like the prior bouts will be under kickboxing rules, not allowing elbows, clinch or knees. In the years that followed their first meeting Parr has fought almost exclusively in full rules Muay Thai mostly in Australia but also internationally though Parr would make an appearance for K-1 MAX as well. Parr even took part in a modified rules Muay Thai and sanda match in celebration of Bruce Lee’s 70th Birthday. Parr in general has had a very high profile career that culiminated in terms of world wide recognition with his appearance on the now defunct Contender Asia series. Zambidis on the other hand has fought mostly kickboxing rules in Greece as well as and was of late still continuing to be involved in matches for the struggling Japanese kickboxing promotion K-1. Zambidis initially got public notice from Australian audiences and international audiences as a protege of Stan “The Man” Longinidus himself an early K-1 competitor representing Australia. The remainder of the card is being fleshed out before the May 27th date but it looks very much like Parr’s farewell tour is underway. 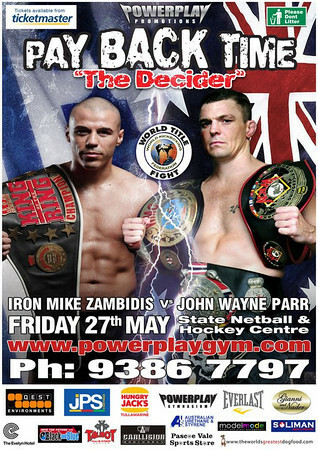 Leading up to this event Zambidis has promised a definitive win against Parr. Tickets will soon be available via Ticket Master. ~ by fatsoking on February 28, 2011.